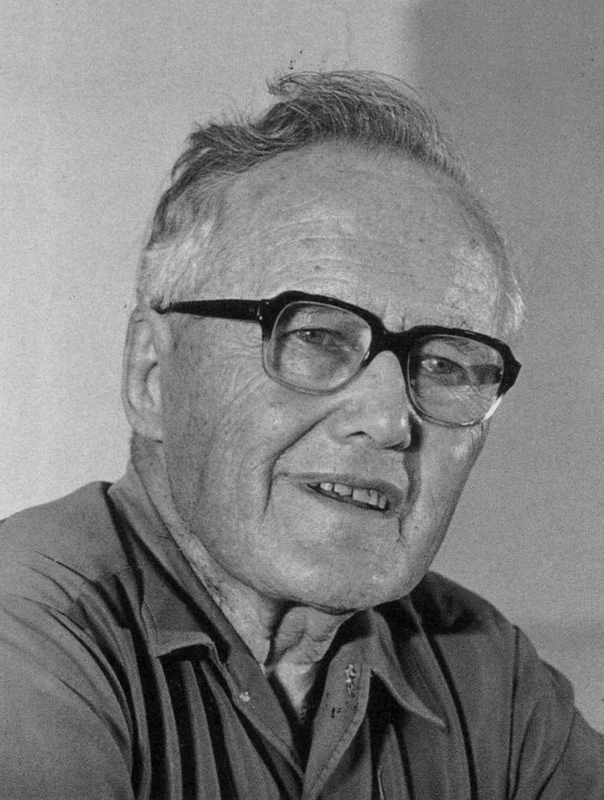 In 1987, Lesslie Newbigin published an essay in the International Bulletin of Missionary Research in which he reflected on a question that was raised by General Simatupang at a conference in Bangkok in the 1970s. The discourse at the conference had turned to the need to rethink evangelism in the West, and Newbigin notes that General Simatupang uttered under his breath, “the number one question is, can the West be converted?”[i] Twelve years later, Newbigin made this number one question the title of his brilliant but lesser known essay. As an African missiologist who has worked in the West for some time, I find both Simatupang’s question and Newbigin’s essay very fascinating. Since my first experience of mission among Europeans in Saint Gallen, Switzerland, almost twenty years ago, to my efforts at church planting in Minnesota, USA, to now teaching mission and theology in Britain, I have wondered, can the West really be re-evangelised? It is now thirty years since Newbigin’s “Can the West be Converted?” was published. I take advantage of this anniversary of the essay to revisit some of the issues Newbigin raised and reflect on them afresh in a world that is different from that of the 80s when he wrote the essay. I am writing as an African resident alien among Westerners, reflecting on mission in the West through foreign eyes. As I engage this Newbigin’s essay and his wider corpus, I am aware that I am approaching ‘holy ground’. My elders in Malawi would advise me to proceed with great caution—you do not play where an elder has been laid to rest. With great caution, indeed, do I attempt to reflect on one of the works of Britain’s most eloquent missiologist of the twentieth century. Can the West be Converted? To ask the question, “Can the West be converted?” is to risk being misunderstood. It is a rhetorical question that holds a pessimistic tone; the person asking seems to doubt the possibility of the West ever being converted. Maybe the inquirer anticipates to hear a “Yes, but ….” in response. Or probably an outright “No, it is not possible.” This seems to be what General Simatupang was saying; that the West—as he knew it back then—could not become Christian again. It had become too secularised to respond to the gospel. Newbigin’s essay, however, is more optimistic: Yes, the West can be converted if Western Christians recognise that the West is now a mission field and engage it as such. In addition to asking a rhetorical question that seems to expect anything but an affirmative answer, to talk about ‘converting people’ today may seem anachronistic. Many of my Western friends would frown at my use of the word “conversion” because to them, it has a negative connotation. Most of them will say converting people to Christianity sounds more like compelling them to adopt a better religion and a superior culture which then implies some arrogance and superiority complex on the part of those doing the evangelising. In all fairness, such ‘conversions’ happened many times in mission history, especially during the colonial era. However, looking at the West from outside, I am convinced that what is needed to re-evangelise Westerners is nothing short of conversion. General Simatupang was right. The typical Western psyche appears so secularised that I believe it will take conversion for Westerners to embrace Christ again. Part of the challenge is the deep-seated belief that the Western worldview is already Christian and therefore needs no conversion. If anything, as outsiders, we believe that the kind of evangelism that must engage the non-Christian (or even anti-Christian) beliefs we face now in Europe must be deep enough to engage the very core of Western culture, and such an evangelism has not happened in the West before, or at least, for centuries. I use the word ‘conversion’ cautiously though. While I am convinced that it will take conversion for Westerners to embrace Christianity again, I am also certain that this conversion and the evangelisation that makes it possible will look different from what happened when Westerners evangelised and converted Africans (or Koreans, or any other non-Westerners) one hundred years ago. It will not be a top-down evangelism that also seeks to ’civilise’ the convert, promising some form of upward mobility (through access to health care, education, and power). Westerners will not be converting to a powerful religion that dictates the West’s cultural values. In most cases, they will be converting to a marginalised and liminal religion that often struggles to even tell its story—that of a crucified God who lives and loves the world. Or that of its bloody history down the centuries. Stories that do not make sense to many Western sons and daughters of the Enlightenment and modernity. Consequently, the type of evangelisation that will speak to them will have to be apologetic in its approach, humble in its outlook, and less confident in its posture and its truth claims. Yet, evangelisation it will be, and it will demand a conversion—not to a religion but to a new way of life under the lordship of Christ. Is it really possible to re-evangelise Europe? Some of the people who believe that the West can be re-evangelised point to the history of revivals and how, within a short time, the desert becomes a fruitful field (to use imagery from Isaiah 32:15 which I have heard preached in many revival meetings). These Christians pray and hope for an outpouring of the Spirit strong enough to make Christianity admirable again in Europe. A good British example that is commonly mentioned is the Welsh Revival of 1904 to 1906, the impact of which is still seen today (for instance, when Welsh football supporters sing hymns at games). Across the pond, in North America, good examples include the Great Awakenings and the Azusa Street Revival when somewhat secularised peoples responded to the move of the Spirit and were converted en masse to evangelical Christianity. If God moved in such a mighty way in Wales, Boston, Los Angeles, and many other places, they believe, there is nothing that can prevent God from moving likewise in England today. Others who believe that the West can be converted but do not believe in revivals—the word “revival” itself seems to have different meanings in various parts of the Christian West—trust that if their congregations do more outreach, become more attentive and kinder to their neighbours, have a coffee shop or an artistic hub in their basement, or have a better preacher and an even better worship band to provide a perfect Sunday service experience to their clientele, people will somewhat begin to respond to the Gospel, and consequently, their neighbourhoods will be converted. This, they believe, justifies their optimism that the West can be converted. Both these responses are only scratching the surface of the issues we face as mission thinkers, scholars, leaders, and practitioners in Europe today. A great deal has changed on the British religious landscape since Newbigin wrote his essay in the mid-‘80s but, in a nutshell, the situation looks a lot darker in 2017 than it did in 1987. Christianity has been losing adherents for decades and efforts to slow down or reverse the haemorrhage have mostly been unsuccessful. Census figures of 1991, 2001, and 2011 reflect rather clearly that the numbers of those who identify as Christians are not holding up—falling from 72 percent in 2001 to 59 percent in 2011. 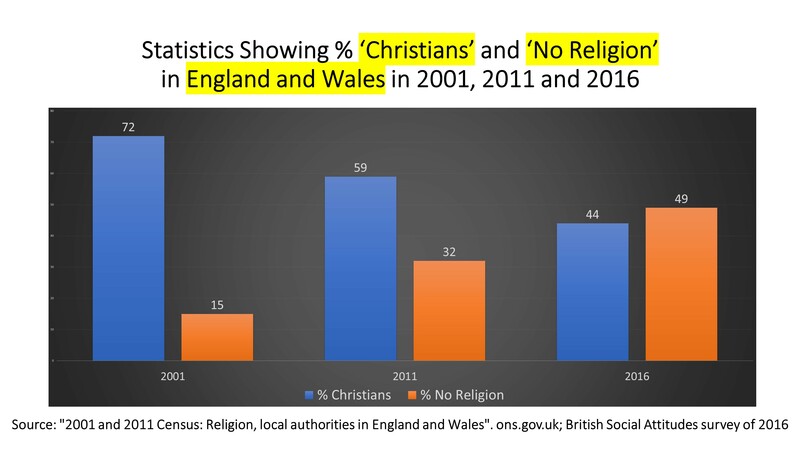 The British Social Attitudes survey of 2016 concluded that the number of people in England and Wales who identify themselves as having no religious affiliation has reached 49 percent, exceeding—for the first time—those who self-identified as Christians at 44 percent. Where the church is growing in Britain, it is largely because of migration—especially that of African Christians. In London today, over 60 percent of church attendance on any given Sunday will be of African peoples (including those from the West Indies) while those African peoples form only 14 percent of London’s population. This fact that a 14 percent ethnic minority made predominantly of migrants can account for 60 percent of church attendance in a global city like London ought to make us think seriously about mission in the West. Of course, all this could not be foreseen even thirty years ago. It is because of these changes that the need to talk about “evangelising the West” is more pronounced now than it was in the 1980s. In his Unfinished Agenda, Newbigin said that “[Mission] is much harder [here] than anything I met in India. There is a cold contempt of the Gospel in Britain, which is harder to face than opposition.”[ii] He was right. Today, most Westerners are not just disinterested in Christianity, they are often antagonistic to it—something that has gotten worse since the 1970s when Newbigin returned to England after spending over thirty years in India. Newbigin was also right in his diagnosis: Western Christianity is still struggling to cope with the impact of the Enlightenment and modernity on European and other Western cultures. [iii] For the past 300 years, a strong cultural bias in Europe towards science, reason, and logic has resulted in a dualism between the material world that we see and the spiritual world that is unseen, and then favouring the former, pushed a great deal of the mysterious in religion from the public sphere. The belief that everything worth knowing is scientifically calculable, measurable, and observable meant that religion lost its value in society. In a black and white facts-versus-values world, facts won, and many European Christians responded by adapting their faith and theology to science, reason, and logic. To do this, they had to relegate those aspects of the faith that could not withstand a scientific interrogation to the private spheres of life. Since the mid-1600s, an increasingly greater segment of European Christianity has tried to belong within the sciences by adopting a reasonable approach to faith. In the 1700s, theology began to seek recognition as a scientific discipline as the likes of Friedrich Schleirmacher tried to make sense of Thomas Aquinas’ “Theology is the queen of the sciences.” In the end, we find ourselves with a Christianity that is just as dualistic as the wider Western culture; one that has adopted the bias towards the material and struggles to make sense of the spiritual. Again, Newbigin is right in pointing to Christianity’s engagement with the Enlightenment as central to its disestablishment and to the demise of Christendom. I suspect it was his long stay in India that enabled him to see the religious landscape of Britain with foreign eyes. The Indians, just like Africans would, must have shown Newbigin that a religion domesticated by reason and science loses its power to be a religion. Rationalism and science do not set the limits for religion. Of course, many non-Western Christians believe in science and reason, but they are also very aware that what they believe in their religious life is much wider than science can fathom. Science, for them, does not answer all questions, and they must, therefore, allow for the spirit-world to be more engaged in their life and worship. Of course, their Christianity is undergirded by a worldview that lacks the material/spiritual dualism of modernity. I do remember one of my grandfathers, a spirit medium and herbalist, making an apology for refusing to convert to Christianity saying, “Your religion has no sense of mystery and wonder. Its spirit is too passive and, therefore, it is no religion.” He would later tell me, “A religion that fails to connect with the spirit is only a moral philosophy whose only good news is either moral legalism—’thou shalt have no abortion’ or ‘thou shalt not be gay’—or moral liberalism—’if the wider culture says it is alright, regardless of what the Bible says, then it is alright’.” In response to his charge, another one of my Christian grandfathers founded an African independent church in which he tried to imagine a Christianity in which the Spirit was alive and active. In A Secular Age, Charles Taylor says a typical Westerner is a “buffered self”; an invulnerable self, isolated and protected from any sense of the transcendent, essentially living in a world without God or spirits because they do not exist or they are too far away (and if they exist, they are neither needed nor welcome anyway). This is the extent to which dualism can take us. Yet, a major part of western Christianity today is grounded in this dualism, shaped by and for the buffered individualistic self, and ignoring the spirit world, living according to science, reason, and logic. Such a Christianity tends to demythologise the miracles of the Bible because it struggles to imagine how the spirit can defy logic to breakthrough into the material world. Three hundred years of this dualistic Christianity has led us to a place where we know God the Father to be distant and disconnected from us while Jesus sits on a chair inside our hearts guiding our morality, and we have no clue what to do with the Holy Spirit. Of course, in many churches, the Spirit is generally unknown, confusing, and unwelcome. One of my American professors of Systematic Theology once told me, “This dualism has made us (Western Christians) to be practical atheists even though we recite the Apostles’ Creed every Sunday” causing Christians to live their daily lives as if there is no God—as Christian buffered selves if at all that is possible. When I pushed back, he said, “What we are engaged in, which we call Christianity, is simply a moralistic therapeutic deism; this distant god wants us to follow the rules of morality, and after this, that god will make us happy with personalised blessings (usually material) to make us happy.” I think he was too harsh, but he has a point, a buffered self cannot make a good disciple of Jesus. Quite often, the downplay of conversion (even for people who say they are Christians simply because they were born in Britain) makes evangelism impotent. We often tell people to follow Christ without telling them that this will change their lives. Of course, how can a Westerner, born and bred in consumerism, individualism and secularism begin to follow Christ without the change that comes with conversion? Yet, we often invite people to follow Christ without explaining that being a follower of Christ involves adopting a new worldview. It is nothing short of conversion where Enlightenment-shaped Westerners who live in a dualistic world where God is non-existent (or very transcendent and distant) and are buffered from anything that cannot be proven by science, have to switch to a worldview in which God is both real and close, the spirit-world (including both good and evil spirits) is active and in constant contact with the human world, and then be baptised into the fellowship of the Holy Spirit and walk in this same Spirit. This is conversion. Newbigin’s work on the impact of the Enlightenment and modernity on Christianity has inspired many conversations on how to engage the pluralistic cultures of the West in mission. In North America, we have seen the rise of the Gospel and Culture Network as a direct response to Newbigin’s work in Britain. As they contextualised Newbigin’s mission theology, they gave birth to the missional church movement which sparked other conversations like the Emergent Village and the emerging church. Here in the UK, we have seen the likes of the Alternative Worship movement and the Fresh Expressions. These movements have all proposed missional tools, means, habits and practices that, if followed, will help congregations become missional and help re-evangelise Europe. Unfortunately, in my opinion, most of these conversations never really managed to escape the spiritual-material dualism and everything it entails. For instance, the secular-sacred split thrives on. A great deal of their missiology would remain intact if the Spirit were to be somewhat redacted out. For most of them, the miracles of Jesus remain demythologised and must still be scientifically explainable. Two easy examples of how this shows is the absence of the call to prayer and the minimal attention given to the gifts of the Spirit in most of those conversations. They are able to talk about all the best practices and strategies for mission without attending to the one factor many non-Westerners consider the most important; prayer. As I write this, I think of my friends who are starting a missional community in the Midlands that is totally dependent on social engagement with the neighbours. Facebook, Twitter, and Instagram are their primary tools. They believe they can start a missional community without engaging the spirit-world in prayer. 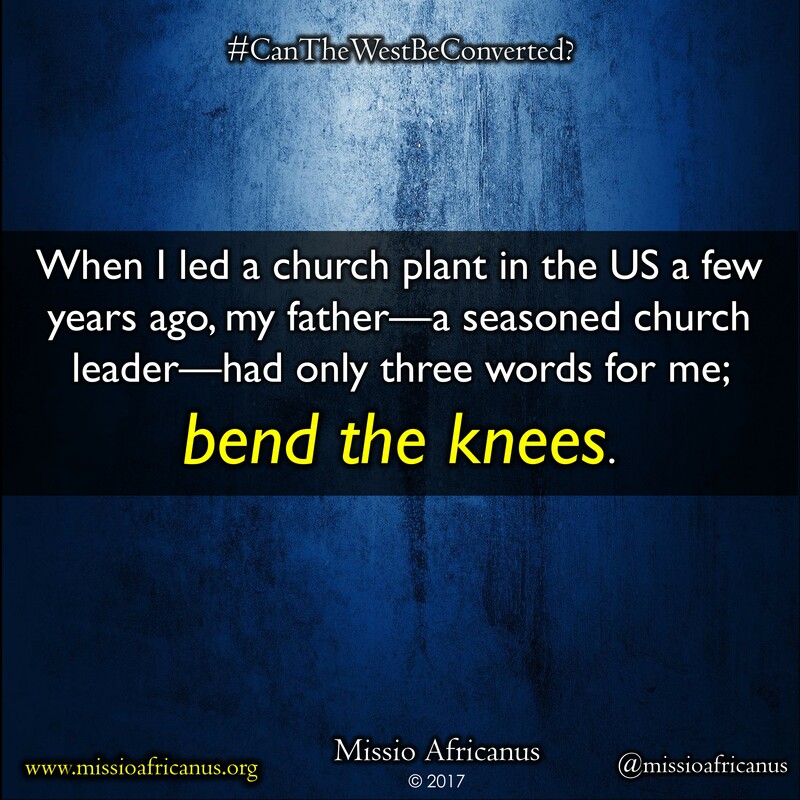 When I led a church plant in the US a few years ago, my father—a seasoned church leader—had only three words for me; bend the knees. These friends of mine in the Midlands see no need for prayer or anything that may look religious and yet (and maybe because of this) they are missional leaders. How can one be missional without paying attention to the Spirit and the spiritual world around us? In the second part of this post, the question ‘Can the West then be converted?’ is answered emphatically with adequate justification. This can be found here. [ii] Newbigin, Lesslie, Unfinished Agenda (Geneva: WCC Publications, 1985), p. 249. [iii] Newbigin’s other works like Foolishness to the Greeks, The Open Secret and The Gospel in a Pluralist Society explore the impact of the Enlightenment and modernity on European cultures and how they respond to religion and Christianity.